This year’s Los Angeles Auto Show is a treasure trove of track-worthy debuts. As California is known for its perfect weather and as the world’s tech mecca, it’s little wonder that we see so many sun-suited cars unveiled here, many of which push the performance envelope, employing the latest in e-hybrid technologies. For obvious reasons, this is good news for TrackWorthy. We’re releasing a series of short articles highlighting the most exciting track-worthy debuts from the show, including photos, videos and interviews with some of the key people involved in conceptualizing, producing and selling these magnificent cars. The BMW i8 Roadster is BMW’s first convertible plug-in hybrid. The roadster delivers its open-air freedom with the help of an electrically-folding soft-top, which can deploy in under 16 seconds at speeds up to 50kph. The soft-top folds into a compartment where the rear seats would be in the coupe. Hence, the roadster is a two-seater. From a design standpoint, the BMW i8 Roadster is quite striking, and many of its good looks serve functional purposes. Owing to design challenges, dropping the top on a model often means losing exotic door function. Remember Mercedes’ SLS Roadster? 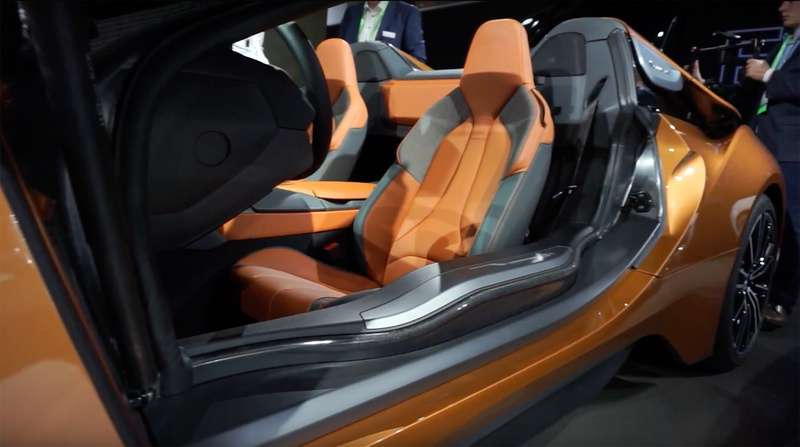 Not so with the BMW i8 – thankfully, the roadster features the same signature scissor doors as the coupe. The roadster also maintains a similarly sleek, streamflow design and aggressive rear air ducts as the coupe, which help reduce drag and improve efficiency. 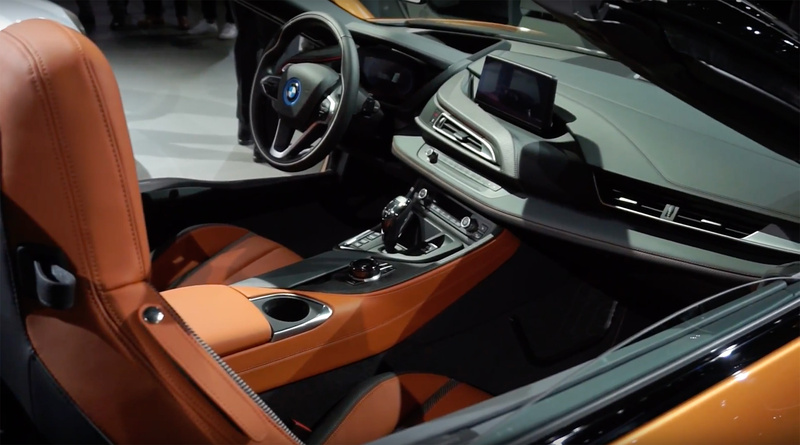 The i8 Roadster is shown in a beguiling E-Copper Metallic at the LA Auto Show. We apologize for the poor audio quality during parts of the video. Sadly, we experienced a technical issue with our mic. The i8 is all-wheel drive, powered by a 1.5-litre, 3-cylinder petrol engine and two electric motors. Like the coupe, the roadster can travel up to 30 kilometers on battery alone while traveling below 120 km/h. The combustion engine will engage either at speeds exceeding 120 km/h, or with heavy acceleration. The electric and combustion engines combine to produce 369 horsepower, a 12 hp boost over the previous model coupe. With the help of a whopping 420 lb/ft of torque, the roadster can accelerate from zero to sixty mph in 4.4 seconds, just 0.2 seconds slower than the coupe. Both cars hit electronically-imposed speed ceilings of 250 km/h. BMW plans to start selling the roadsters in spring of 2018. Although the company has not yet announced roadster pricing, the 2018 i8 coupe starts at USD $144,395.